The nineteenth century saw the creation of the Regiment following the amalgamation of the 100th Regiment of Foot with the 109th (Bombay Infantry) and the Irish Militia Units King's County, Queen's County and Royal Meath. This period was also the 'British Empire period' when as the 100th and 109th (formerly 3rd Bombay Europeans) the two regiments experienced action around the world. The story of the 109th from the 3rd Bombay Europeans is itself a piece of Empire heritage when Britain's respect for its soldiers would vary from worship to abandonment. The Association, as guardians of the Regiment's heritage, presents the history of the Leinsters in some detail, and the content of this history tale will grow and become richer as more information is archived here on the Association's website. As you are now a student of the Regiment may we suggest that to fully appreciate the heritage and diversity of the men who served in the Regiment, you start at the 18th Century and work forward. 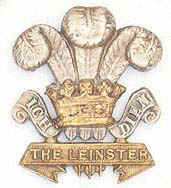 If you arrived at this page as part of that Journey we hope you are impressed by the actions of The Prince of Wales's Leinster Regiment (Royal Canadians).